As horsepeople, we know it’s necessary to implement slow transitions between grains and forages when changing our horse’s diet, but why the caution? The foregut consists of the stomach and small intestine and is the site of immediate absorption of nutrients directly from the GI tract. Nutrients that aren’t readily absorbed in the foregut move on to the hindgut where they are subjected to microbial fermentation. 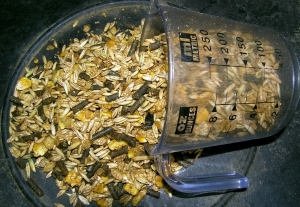 This is an additional digestive process where much of the forage and fiber is reduced to useable products by the horse. When changes in feed happen too rapidly, the microbes cannot adapt quickly enough which can result in colic and GI upset. Keep in mind that when you’re feeding your horse, you’re also feeding the healthy bugs in his gut too! When transitioning a horse to pasture, start by grazing your horse at 1-2 hours per day initially, and increasing their grazing time by an hour every other day until the desired daily grazing time is met. 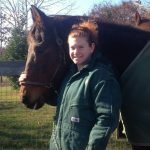 Keep in mind, horses with equine metabolic syndrome, insulin resistance and a history of laminitis are incredibly sensitive to the sugars in fresh pasture grass and as such, their grazing should be minimized or eliminated completely to prevent the development or further propagation of laminitis. What about grain overload cases? To understand the veterinary emergency these cases present, it’s important to note that feed material moves through the foregut at a quick rate. Most of the simple sugars in grain are absorbed in the foregut, meaning whatever ingesta makes it to the hindgut in normal situations is low in readily digestible starch. When horses consume excessive amounts of grain, those simple sugars move through the foregut at a rate faster than they can adequately be absorbed. As such, when they arrive in the hindgut, the microbes immediately digest those simple sugars which results in an increase in the production of lactic acid. (Lactic acid is a byproduct of microbial fermentation). As the amount of lactic acid in the hindgut increases, it increases the acidity of the hindgut environment which in turn kills the microbes in the hindgut. When these microbes die off in large numbers at a quick rate, they release endotoxins. These endotoxins are absorbed into the bloodstream and make their way to the laminae of the feet (along with everywhere else in the body). The laminae in the feet are extremely sensitive to endotoxins and as such, laminitis is often a side effect of grain overload. 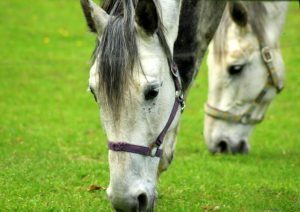 When it comes to making changes in your horse’s diet, the key is to make changes, whether forage, grain or pasture slowly and consistently. When adding new grain to the diet, a safe rule to follow is to increase the daily grain ration by one pound every 3 days until the final weight of grain is reached. If you have questions about the type or quantity of grain your horse should receive, ask your veterinarian to work with you to develop a nutritional plan that meets your horse’s needs. Your veterinarian should take into consideration your horse’s current body condition score, the amount and quality of forage available to him, workload, life stage, and metabolic status. Also, keep in mind that it takes 6-8 weeks to appreciate nutritional changes in your equine partner so be patient and stay the course that you and your veterinarian develop for those first few months before making additional dietary changes.